Cued Mile Failte - a hundred, thousand welcomes! 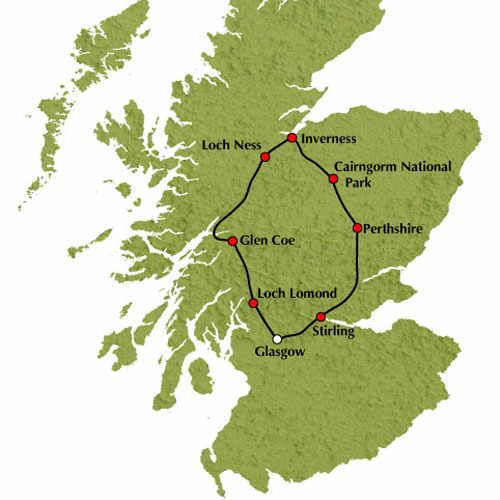 This is the definitive Highland experience that will introduce you to the very best of the Highlands is just one day. This really is Essential Scotland! Our journey northwards takes us along the "bonnie, bonnie banks” of Loch Lomond. Driving the length of the loch we'll cross into the Highlands and as we do look out into the loch and you'll see some of the 23 islands on the Loch, four of which are still inhabited. Our coach will climb the Black Mount which gives wonderful views over Loch Tulla. Next we drive across desolate Rannoch Moor to reach haunting Glen Coe, the "Glen of Weeping". No matter the weather there is nothing that will prepare you for the beauty of Glen Coe. This famous valley resonates through Scottish history as a place of great significance. We will make a stop here so you can soak up the atmosphere of this special place for yourself. Fort William, the largest town on the Highlands, sits at the foot of Ben Nevis, Britain's tallest mountain. We'll stop to enjoy the vista before heading into the Great Glen, a picturesque valley of lochs and mountains whose history has been carved from bitter clan disputes, as we shall hear. Mysterious and evocative Loch Ness is a real highlight. We'll drive along the entire length of the loch making a stop at Urquhart Castle, a popular vantage point with "Nessie” spotters! You can mount your own exploration by taking time to visit the castle and enjoy a short cruise on the loch *. At Inverness, the Capital of the Highlands, we turn southwards for home. Our journey continues through the picturesque Spey Valley before crossing the Grampian Mountains to reach Perthshire and the Forest of Atholl. We make a final stop for afternoon tea before making the final part of our journey to Glasgow. Child rates apply from 5-15 years inclusive. We regret that children under 5 are not carried on this tour.